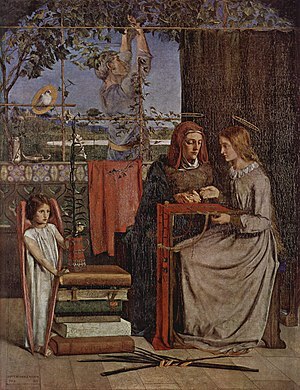 Agnes: January 21st is the feast of St. Agnes and according to folklore, on January 20th, which John Keats’ was inspired to write a poem about, unmarried girls are supposed to see a future glimpse of their husband in their dreams the night before, provided they do not eat that day. Sarma, Sarmite: These 2 Latvian lovelies come directly from the Latvian word for hoarfrost. The latter is pronounced sar-MEE-teh. Kirsi: This Finnish female name is associated with the cherry fruit but also means “frost” in Finnish. Epiphany: January 6th officially marks the end of the Christmas season, when the Magi finally were able to locate the Christ child and bestow gifts upon him. The Chinese plum is the flower emblam for Spring, in Chinese it is called Meihua and its Japanese name is Ume. In Korean it is called Maesil and Vietnamese it is called Mai. In Japan, the flower emblem for January is the Camellia. The ruling planet of Capricorn and Aquarius is Saturn, so Saturnina or Saturnin/Saturnino are also names to consider. Finally, here are names that mean “January,” some come directly from words, others are a translation of the Latin male name Januarius. I thought I would do a list each week of names inspired by words from endangered or extinct languages. Here is a list of Aragonese words that would make great names. These are hypothetical, not necessarily legitimate, but what a great way to keep a minority language alive by using one of its words as a name, especially if you have heritage from that culture. Antina/Ontina: name of a type of weed endemic to Aragon. Arizón/Erizón: name of a type of shrub found in Aragon. Betiquera: name of a type of clematis found in Aragon. Brinzón: name of a type of shrub found in Aragon. It’s use as a given name can possibly be traced to the 16th-century. Records indicate a scattering of Jereachs and Jerichs in England, and Jerigos in Germany is attested to many times, though I cannot tell if these are related to Jericho or if they are a form of George or Jeorg. Jericho definitely comes up in records by the 18th-century both in England and the United States. The name first appeared in the U.S. top 1000 in 2013 and currently ranks in as the 932nd most popular male name. A possible short form is Jerry. The name appears in other languages in the following manner, though keep in mind that most of these are anecdotal. It was popularized by one of the twelve Apostles, who is now considered a popular Christian saint. It is suggested that Andreas was a nickname given to him, or possibly just a direct Greek translation of a Hebrew name that had a similar meaning, now lost to history. 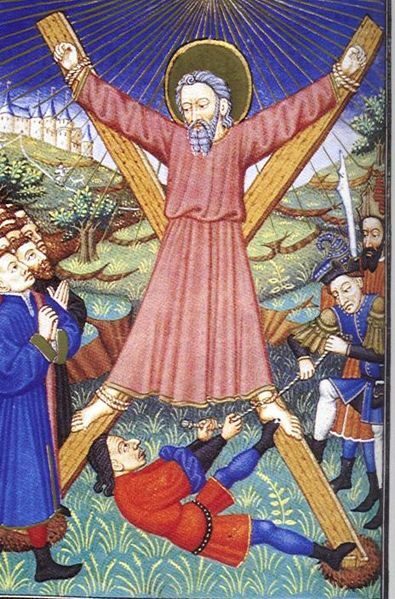 Saint Andrew is considered the patron saint of Scotland, Russia, Greece and Romania. According to legend, he was martyred around the Black sea on an X shaped cross. His designated name-day is November 30. Other forms are as follows (listed alphabetically by linguistic origin). Belorusian diminutives are: Andros, Andruk and Andrus. Czech masculine diminutive forms are Andy, Ondra, Ondrášek, Ondrejko, Ondrík, Ondřejek and Ondříček. French diminutive forms are: Dédé, Ti-Dré, Andi, Déa & Andy. A German diminutive form is Andy/Andi and English are Andi, Andie, Andy, Dre and Drew. A Hungarian diminutive is Bandi and Polish diminutive forms are Andrzejek, Jędrek and Jędruś. Scotch diminutive form is Dand. Note: Andrea is a common feminine form in most European countries outside of Italy and Albania, particularly in Germany and the Anglo-phone world. Whether this is a borrowing from the Italian and was changed, or a coincidental evolution, is unknown. What is known is that Andrea has been used in England as a feminine form since the 17th-century. Czech diminutive forms are: Adrejka, Andruška, Andra, Rea. English diminutive forms are Andi, Andy, Annie and Drea. The name was borne by famous Latin poet, Publius Vergilius Maro (70–19 BCE), the author of the Aenead, credited for being one of Rome’s most epic poems. 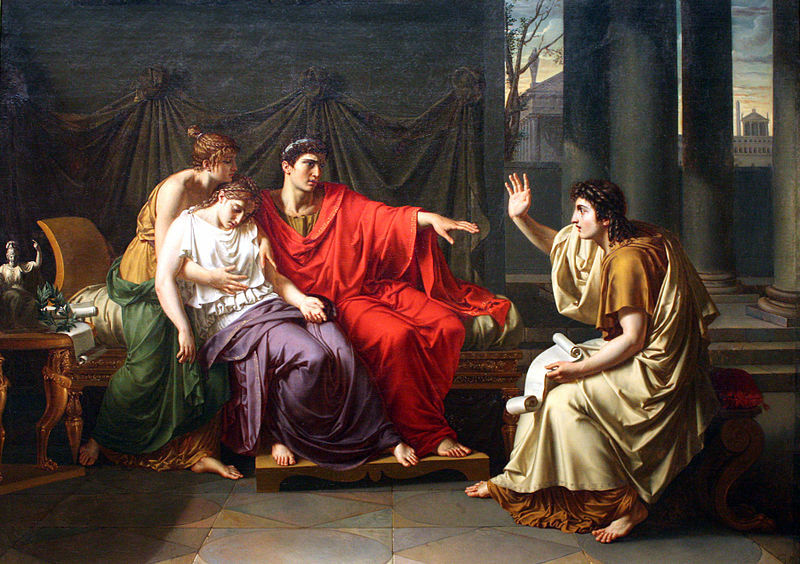 Dante used Virgil as the guide in his Inferno and part of Purgatorio. The origins of the name are unclear, Virgil itself is derived from the Latin, Virgilius/Vergilius, a Roman family name of uncertain meaning. As of 2009, its French counterpart of Virgile was the 333rd most popular male name in France. The name was also borne by an 8th-century Irish saint and missionary, Virgil of Salzburg. The name is composed of the Greek elements, eu ευ (good) and laleo λαλεω (talk). The name was borne by two different early Spanish saints, both of whom are believed to be one and the same person. 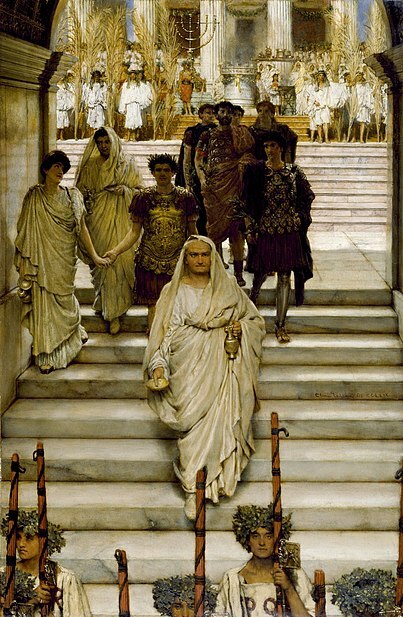 St. Eulalia of Mérida was a 3rd-century teenage Roman girl who refused to give up her faith, she was subsequently tortured and crucified, legend has it that when she was cut down from her cross, a layer of snow fell to cover her nakedness. 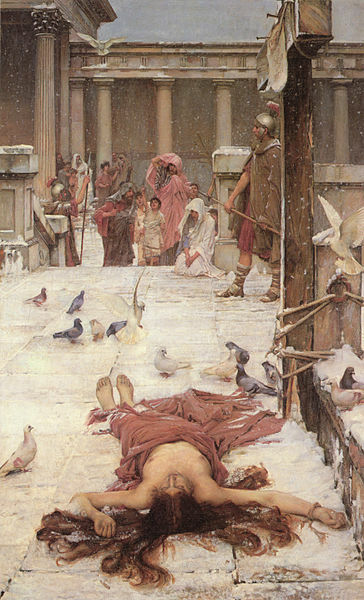 The story was the subject of the famous painting by John William Waterhouse, (above). In the English-speaking world, especially in the United States, Eulalia and her other forms appeared in the U.S. top 1000 from the 19th-century till the 1930s. She never ranked high, the highest only being # 365 in 1893. Her French form of Eulalie also experienced some usage but fell out of the top 1000 by 1900. The highest Eulalie ever ranked in the United States was at # 687 in 1893. Eulalie’s introduction into the United States may have had something to do with Edgar Allan Poe’s 1845 poem, Eulalie. Eulalie is one of Poe’s less Gothic works, it recounts how a widower once again finds happiness in a girl named Eulalie. Two famous American bearers were Silent film actress, Eulalie Jensen (1884-1952), and Eulalie Spence (1894-1981) an African-American play-write of West Indian extraction. Further up in North America, the name was borne by French-Canadian Blessed and religious foundress, Eulalie Durocher, aka, Soeur Marie Rose Durocher, who is credited for finding the Order of the Holy Name of Jesus and Mary (1811-1849). In French naming history, Eulalie appears in a famous folktale, Jean, the Soldier, and Eulalie, the Devil’s Daughter. Notable French bearers are numerous, but one of the most famous has to be an early female journalist by the name of Eulalie de Senancour (1791-1896). In the United States, Eula was probably the most common form. 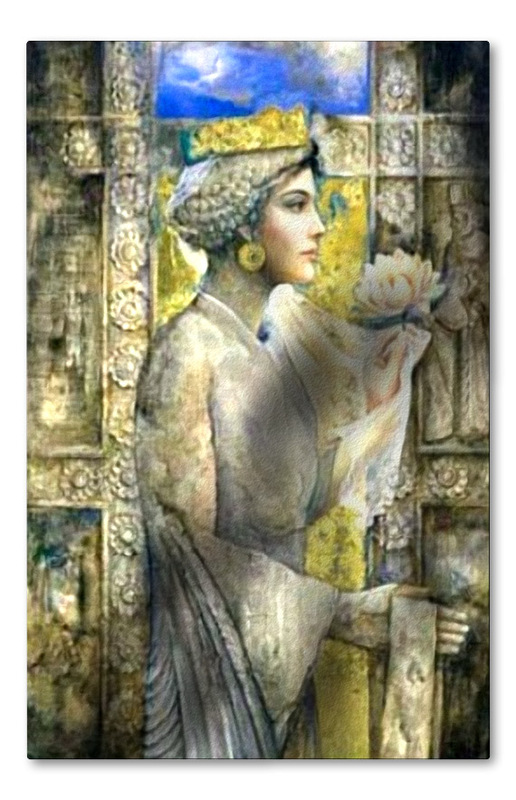 She consistently remained within the U.S. top 1000 between 1880 and 1960. The highest she ever ranked was at # 122 in 1908. As of 2009, its French form of Eulalie was the 472nd most popular female name in France. Eulalia is also the name of a type of grass. A common French and English short form is Lalie. The name was borne by a 4th-century Christian saint and martyr, a Roman soldier of Greek ancestry who refused to sacrifice to pagan gods as demanded by the Roman Emperor at the time. He was popularized in the Western Christian Church after the Crusades, when soldiers brought the story back to Western Europe. The saints’ story was embellished and his story appears in the Golden Legend. The most famous legend was that during the saint’s life, he managed to rescue a maiden who was about to be sacrificed to a dragon by slaying it with his lance. This legend has been the subject of art for centuries. Though revered as the patron saint of England, the name itself did not catch on in until the 18th-century, following the accession of George I of England. The name has been borne by several kings throughout Europe. It was also borne by the first president of the United States, George Washington. In Medieval times, English troops would chant “by George“, as a invocation to the saint to protect them in battle. In ancient Greece, Georgos may have also been used as an epithet for Zeus. Anne is possibly one of the quintessential classic English and French female names. Prior to the 18th-century, it seems that every other girl born in England was either named Anne, Jane or Mary. There were several British and French queens who bore this simplistic moniker, including the ill fated Anne Boleyn, the mother of Elizabeth I. The history of Anne is rather long and complicated. It was foremost popularized through the cult of St. Anne, a legendary figure who was said to be the mother of the Virgin Mary and the grandmother of Christ. In Brittany, the name became especially popular because it happened to coincide with the name of an ancient Celtic goddess, her cult being replaced by St. Anne’s. In fact, it was borne by one Breton Princess, Anne of Brittany. The name was introduced into Britain by the French-Normans after the invasion in 1066. Previously, there had been a minor Saxon king named Anna, but in this case the name is related to the Saxon arn (eagle). Anna and Anne are still occasionally used as male given names in Friesland. Other than the apocryphal saint, the name Anne can be traced directly back to the Bible. In the New Testament, it is the name of a prophetess who predicts the Crucifixion of Christ. Hannah is borne in the Old Testament by the faithful mother of the prophet, Samuel. Hannah has always been popular among Jewish families, but was virtually unheard of among non-Jews before the Reformation, except in some cases where it may have been used as a diminutive form of Johanna, spelled Hanna. It was the Byzantines who had introduced the Anna form to the world, making it popular throughout Eastern and Southern Europe. It was a very popular name among the Byzantine royal family and it was borne by the majestic Anna of Byzantium. Anna may be the more melodic form of the bunch, but Anne’s minimalistic qualities are charming. Short, to the point, no frills. It’s not a bad name, though it does lack some spice, which is why parents are probably more attracted to its more exotic alternatives. In fact, Anne only comes in at # 608 in the top 1000 female names of the United States. It is safe to say, however, that she is very much loved in the middle name spot. Hanna without an H is the prefered form on Continental Europe, usually pronounced (HAHN-nah) and in French like Anna. Hanna and Hanne (HAHN-neh) are also used as diminutive forms of Johanna/Johanne in the Netherlands, Sweden, Norway, Denmark and Germany. There is the Hungarian Hajna pronounced (HOY-no). The Czech/Slovak form of Hana nickname Hanka. There are the Yiddish forms of Heyna, Hayna, Hejna (all pronounced like HAY-nah) including the diminutive forms of Hena, Hende, Hendel and Henye. The Polish diminutive form of Hania, which might make an interesting alternative to Anya or Hannah. Hannah, Hanna and Henna are all used in the Middle East. Of course, how could we ever forget the popular diminutive forms of Annie and Nan. 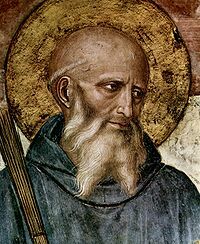 The name comes directly from the Late Latin name Benedictus meaning “blessed.” The name was borne by a 6th-centuy Italian monk and saint who credited for being the founder of the Order of the Benedictines. The name was very common throughout Medieval Europe, being borne by 16 popes, it was fairly popular in England, in the form of Bennett. The name was also commonly used among German-Jews, being used as a cognate of the Hebrew male name Baruch בָּרוּךְ (blessed). In the United States, the name became taboo to use due to its associations with Benedict Arnold (1741-1801) a famous American deserter and traitor to the British. The name recently skyrocketed in Germany after the succession of the German born Pope Benedict XVI. It is currently the 93rd most popular male name in Germany, (2011). It is especially popular in Bavaria. In Ancient History, the name is borne by Titus Flavius Vespasianus, the tenth Roman emperor in the Roman Empire and the second of the Flavian Dynasty. In the New Testament, the name is borne by a companion of St. Paul who later became the first bishop of Crete and was a recipient of one of Paul’s epistles. The name was also used by Shakespeare for his tragedy Titus Andronicus (1593). Currently, Titus is the 253rd most popular male name in Germany, (2011) and the 397th most popular in the United States, (2010). An Italian, Portuguese and Spanish feminine form is Tita. The designated name-day is January 4th.